Android SmartWatch has so many applications that can be installed in it, and Google keeps on adding more applications in Google Play Store. Out of the so many apps found in the Play Store, there are some that are must-haves to make life exciting and easier. Since its initial launch, Android Wear has not been turning heads like it was imagined during the first days of its launch. But of late, it has made huge progress making it the best platform available on watches. 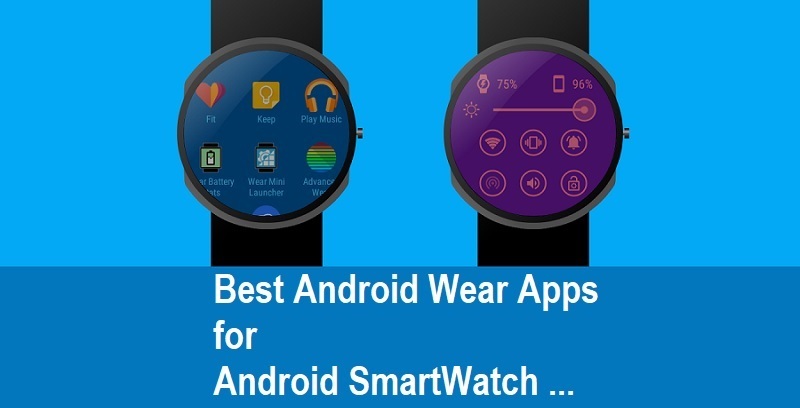 So here are the Top 12 Best Android Wear Apps for Android SmartWatch that will enable you to leave your phone in your pocket and to brandish your watch with a lot of pride. Everybody at least owns a Gmail account. For the smartwatch users, Google has made it easier to access your accounts; you can now receive all the notifications from your email. There is no more need of checking your email every time from your phone/laptop while waiting for an important email. One can specify if he/she wants to receive all the emails or just the most important emails. Even though the process of specifying is complicated because they don’t have a direct button for that, it has to be specified on the phone first. In Messenger App, you don’t have to type, you can dictate your messages, see incoming messages from social media like Facebook or just normal messages and be able to reply them.Who wouldn’t love just dictating their messages? In case you are wondering how do you text back, the messenger has a built-in keyboard that enables you to text. This is a must-have app since you don’t have to deal with money anymore and can be installed on several Android Wear products in the market. It helps one to pay their bills easily since you just have to tap your smartwatch on a contactless payment reader so as to reflect the amount due. Although you require an NFC to be able to use this application. Citymapper is the live and easy app to use since it lets people whether new or checking on their normal means of transport to go directly to the place that they have specified on the app just from your wrist. Imagine looking at that bus you always border or train or even taxi at real-time to ensure it offers you the best route to your location in the shortest time possible. This is mostly developed for travelers to help them get rid of the complexity of maps found on the phone,i.e. the google maps while trying to locate a place. With this app, you don’t have to check your phone every minute to ensure you have not taken the wrong turn. This Android Wear weather app has excellent features that let you view the temperature for the day or a forecast per hour or even the following day's forecast or a whole week forecast on your wrist. The best part of it is that you can view the weather conditions in more than one city. The application can also notify you when to carry your umbrella (this tool is called umbrella) or if there is going to be a rainstorm. Pocket Casts is the most beautiful app on the smartwatch, its colors change continuously to complement the artwork in it. It has themes that you can choose between light displays to very dark themes. We all know that podcast is the best music app on android that’s why Google created one for smartwatches that have an interface looking like one for a tablet. One is able to queue their desired playbacks, forward episodes with a speed between 0.5 to 3x or to skip episodes, play the same episodes on the fly, pause episodes, refresh or even to play the episodes on your TV using only one tap. Runtastic Pro is a one tap operation app for runners or joggers that don't like looking at their phone while running/jogging also it helps them to keep track on their health. You can use the voice command to start and stop your activity. Runtastic Pro enables one to see their calorie count, the time taken and also distance covered. While Runtastic Pro is for runners, Strava is an app for cyclists working on both Android and iOS that has a friendly user interface that can display all the fitness information needed. It enables you to view your pace, heart rate, the time taken, laps covered and the distance covered. After all the data has been collected, it synchronizes automatically on the Strava feed. It also has a one-tap operation together with voice command for start and stop just like a Runtastic Pro and can also let you listen to music while using it. There is no day that can pass without me having to calculate something, whether its dates, money, etc. when in need of quick basic calculation almost every day then this is a must-have app. You can use it in the banks, supermarkets to calculate your bill before getting to the cashier, restaurants to split the bill, or even places mobile phones are not allowed. Although calculators on the Android has a disadvantage f when you need to calculate complex calculations you either have to refer to your phone or the calculator but otherwise, it is still a helpful application on your watch. This is the most popular cab everyone uses to commute easily and a must have for your Android Wear for users of Uber. One is able to order for a ride from their wrist if your phone is out of reach. It will help you to keep track of where your ride is at, the approximate time that will be taken to your destination and an approximate amount of money required before ordering for the ride. Are you missing a partner or a hot date or meeting new people but you don’t like removing your mobile phone from your pocket or handbag to start swiping? Google has Tinder in store for you to install in your SmartWatch. With 50,000 downloads on Play Store alone, Tinder is the uncrowned kind of dating apps, says Dari from TechiesPad. When bored, single and sitting anywhere whether in public or private place you could spice up your time by swiping for that hot date of your wish in comfort and very privately on your wrist. There are so many dating applications on Google play store although this is the best online dating site that is a must-have for you on your Android Wear. Football lovers here is an app for you called FotMob. This app brings you real-time football scores and alerts on goals even when in a meeting or date. Nothing that happens on football news can pass you without getting a notification from your watch in seconds or even minutes. It also has good graphics that one can use to track the key time in the game also the graphics makes easy for you to understand the application.